Everyone like beautiful face. Many times big pores on face reduce beauty of the face. 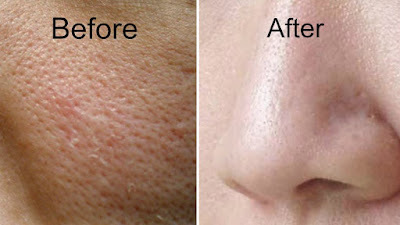 Open pores convert in big pores. Sometime, it makes skin oily. Dust, dirt and bacteria deposited in open pores. This increase black heads. Aloe Vera Gel: Aloe vera is very useful in skin problem. Do massage with fresh aloe vera gel on face. Leave it for 10 minutes. Wash with cold water. The daily use of aloe vera reduces the problem. Apple Sider Vinegar: Mix water in apple sider vinegar. Then apply it with cotton on face. Wash it with cold water. Do not take too much apple sider vinegar. Oats & Egg Face Pack: Prepare paste with white part of eggs, oats and lemon juice. Apply this paste on face for 30 minutes. Wash your face with cold water after 30 minutes. Papaya Face Pack: Mash the papaya. Apply this paste on face for 20 minutes. Wash your face with cold water after 20 minutes. Baking Soda: Mix baking soda and water and prepare its paste. Apply it on face with light hand and do massage for 30 seconds. Wash your face with cold water. Is Milk Malai Good For Health or Not?